Zaza Pachulia collided with Russell Westbrook toward the end of the first half of the Warriors-Thunder game on Wednesday night. 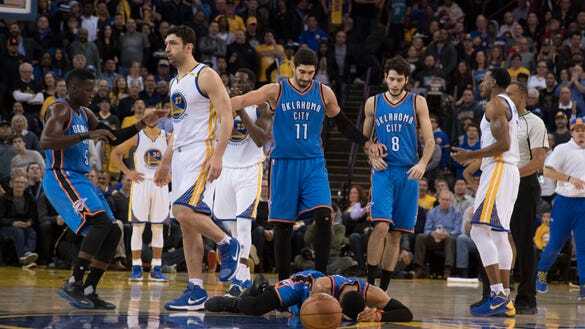 Westbrook fell to the ground while Pachulia stood over the OKC guard and stared him down. At first glance, it may look like the two simply ran into each other, but if you slow it down, you can see Pachulia raising his arms to make contact as Westbrook tries to dribble around him. The officials called a flagrant one on Pachulia. Of course, not everyone agreed with the flagrant call.